My Neighbor Totoro is one of Studio Ghibli’s most magical films. Over the last three decades, it’s become a beloved classic winning the hearts of all ages with its unforgettable story and characters. The film deserves a celebration of its 30th anniversary just as charming as the film itself and luckily, RockLove Jewelry’s new line of necklaces do just that. 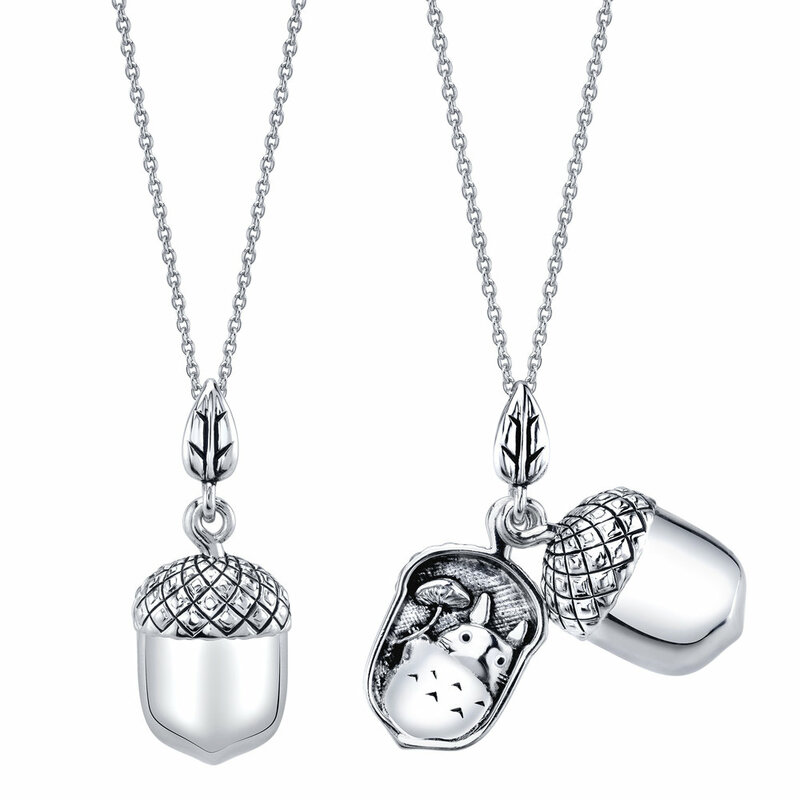 The sterling silver limited-edition collection features three pieces: Branch Totoro, Acorn Totoro, and Spinning Totoro. The designs do an excellent job of capturing the spirit of the character in a fun, stylish way. Only 250 are available for each handcrafted necklace. RockLove designer Allison Cimino told GeekFold the film is her second favorite from Studio Ghibli, with Howl’s Moving Castle at number one and Kiki’s Delivery Service third. “They’re all gorgeous, but I really like the darkness that comes with Howl’s and then the serenity that comes with Totoro. Even though there’s some anxiety and darkness with a child being lost, there’s still a pacing that I feel like Studio Ghibli, and then conversely Laika, are two studios that just have a very serene feeling even if the story starts to get more critical,” she said. The jewelry was created in collaboration with Her Universe and Studio Ghibli to go with Her Universe’s Totoro anniversary fashion collection. According to Cimino, Her Universe founder Ashley Eckstein reached out to her to see if she was a fan and would be interested in creating something special in the jewelry category for their 30th anniversary line. It was a resounding yes from Cimino and soon she was headed to last year’s Studio Ghibli pop-up in San Francisco. There she met the Studio Ghibli creative team for the first time and worked with the Her Universe and Hot Topic teams as well. Not knowing what to expect, she took the risk and brought two sculpted designs with her. “I literally sculpted and brought sterling silver casting originals to show them and be like this is what my translation looks like and this is what my caliber of detail looks like. While I know that you want to retain the integrity of Totoro, this is what I think I can bring to the table,” Cimino explained. Once Cimino began working on the line, Studio Ghibli reviewed the final quality of her work, but otherwise let her do what she needed to while only offering some suggestions along the way. The acorn design also changed slightly because her original showed a full body Totoro tucked into the acorn almost like he was sleeping in a small acorn bed. The feedback she received was that while it was cute, they worried Totoro wouldn’t actually fit in the acorn and might be uncomfortable in it. Cimino worked most directly with Eckstein whose vision to let Cimino bring her style, quality, and integrity to the collection was wonderful to the designer. Cimino said she found it very positive and encouraging. Eckstein was also essential to the question of whether or not the pieces should be sterling silver or if they wouldn’t work for Hot Topic’s price point. So far Cimino has been impressed with how well the line has sold and hopes it will show Studio Ghibli that the North American market wants high-quality jewelry of their films. Cimino would love to create more jewelry inspired by Studio Ghibli films in the future, but nothing is set in stone yet. “I think together between Ashley Eckstein and myself and the fans that have purchased these pieces, that’s going to be the most indicative to Studio Ghibli that we love this and we want another shot to do another film,” she said. Until then, RockLove Jewelry has lots of fun Disney lines in development. According to Cimino, there will be a Captain Marvel line for the upcoming film and a Minnie Mouse line in January that she thinks will be great as giftable Galentine’s Day items. You can find RockLove’s Totoro necklaces online at Her Universe, Hot Topic, and RockLove.